CAM is the way thousands of different goods and services are delivered to customers and clients all over the world. Using software that talks to computer number control (CNC) machines like mills, lathes and turning machines, physical instructions called toolpaths are generated and sent to the machine to subtract a part from different materials (steel, wood, or titanium, for example) with different tool bits. This is why companies like MecSoft want to draw attention to the work they are doing because most of the customer feedback they ask for and receive helps them create a really desirable new version to sell. Each module can be integrated in the Windows Rhino 5.0 CAD program, but if you only need a specific one, you can buy a license for whichever you’d like individually. VisualCAM is integrated inside the VisualCAD base CAD platform with the VisualMILL, VisualTURN, VisualNEST and VisualART modules. The new version can be downloaded here. 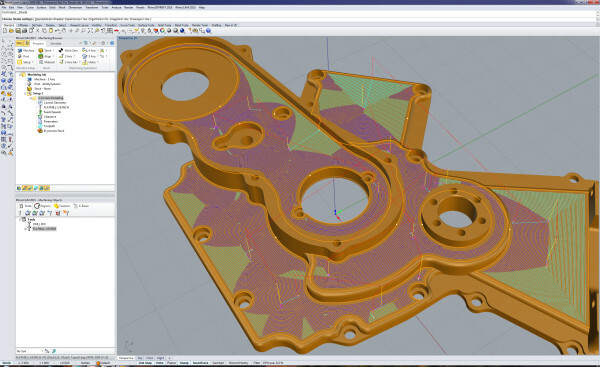 The introduction of feature-based milling and detection means that machining features like prismatic pockets, slots, bosses, planar faces and 3-axis pockets can be detected on surfaces and in meshes of solid models. A new slot milling operation is available for single line and trochoidal (a curve described by a fixed point on a circle as it rolls along a straight line) machining of slots. The toolpath editor can now adjust feed rate slowdown in corners. A new 4-axis drive surface operation for 4-axis milling is available in the current edition. Tooltip help and algebraic operations are now available in all dialog boxes.